For more than 30 years I’ve been a devotee of beers from the Upper Midwest, usually ones from Wisconsin and Minnesota. My relationship started on fly-fishing trips to the Upper Peninsula, where I’d stop at small party stores along U.S. 2 to see what they had to offer. I discovered Leinenkugel’s during the 1970s when it came in simple, Old School bottles with an Indian maiden on it. The beer was fresh, unpretentious, inexpensive and made to be drunk cold after a day of trout fishing. However, my loyalty has waned in recent years as Leinenkugle’s has become more popular and has adopted fancy labels and joined in the Beer Revolution with different types and flavors. When the Beer Revolution started, my sons filled our garage beer fridge with all sorts of concoctions that test the notions of what beer really should be – a simple refreshing drink. As a reminder of the excesses of beer makers, I keep a bottle of one of those revolutionaries in garage beer fridge. Even though my two sons have had tons of beer drinking occasions, nobody has ventured to try it. Least of all not me, I don’t need my beer to be made by Tapist monks from Belgium or to know that the hint of orange in it reminds the brewer of the early morning sunlight in Germany. There’s a line in Norman McClain’s, A River Runs through It that says it all about beer. It’s a throwaway line that doesn’t drive the plot or characterizations, and it jumps off the page for that reason. To paraphrase it: Life was better when every small town had its own brewery. McClain must have liked his beer fresh, and I share his enthusiasm. The major brewers push out so much of the stuff that it sits on the shelves for a long time, and is trucked thousands of miles. Smaller, local breweries produce less, and ship it for shorter distances. They also tend to use bottles only, which is the only way beer should be sold. My relationship with Leinenkugel’s held fast, even as the price increased from $5 to about $8 a six-pack, but is coming to an end with a discovery of Lakemaid Beer from August Shell Brewing Co., of New Ulm Minnesota. 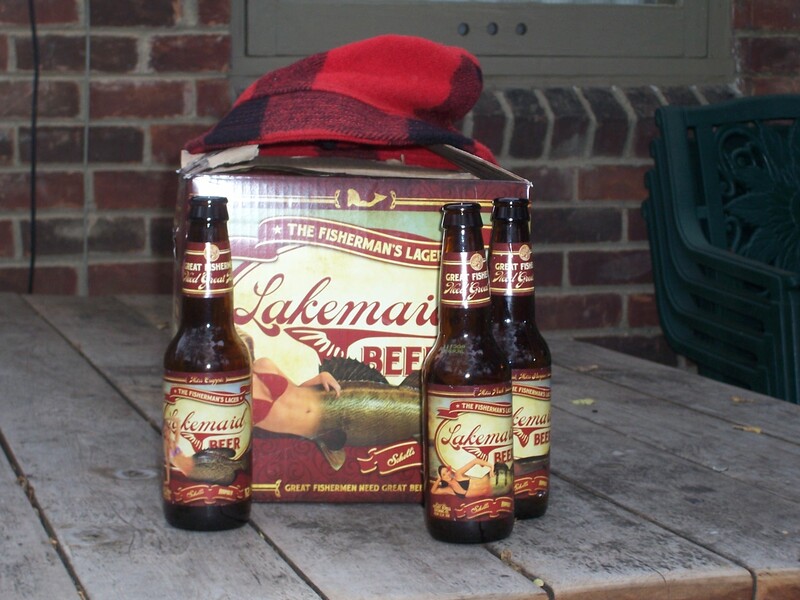 I was in quest of a six pack of Linnies during a recent trip to Manistee Michigan when I saw the Lakemaid beer. Upon seeing it was brewed in the Upper Midwest, I bought a six-pack. It reminded me of what Leinenkugel’s once was – a simple fresh beer. I’ve noticed over the years that as a brand of beer becomes too popular, its quality tends to suffer. As it turns out Lakemaid is a gimmick beer produced by August Shell Brewing Co. and Rapala, the fishing lure giant. The bottle features a mermaid-like woman and is obviously intended to appeal to anglers. They hooked me. Shell makes the popular Grain Belt beer, along with its own brand, which you don’t often see in Michigan. Mermaid Beer comes in various types, pilsner, lager, dark lager, pale ale and other. Each type is adorned with an image of a different mermaid for the various species of fish, such as Miss Muskie, Miss Rainbow Trout, Miss Salmon and even a Miss Catfish. When I returned home to southern Michigan, I unexpectedly found a 12 pack of it in my local store, and quickly purchased it. The clerk told me another customer requested the store carry it, and I was thankful to the stranger. The cost was $12, which is reasonable these days. I’ll be back for a second round. And now I'm on the search for Mermaid Beer. I'll forward your link on, if you don't mind, to a couple of my fellow judges and brewers. We're a hearty bunch and love to dive in to the unusual and 'non-mainstream' Stuff. I haven't heard of it, but I'm sure one or two of them have since they've been doing this much longer than me. Thanks, Jeff.